What is the best solution to problems with data infrastructure technology? Problems with data infrastructure technology can be a huge issue for any business, and while data infrastructure is set to be the future of businesses, a single glitch or small issue can leave a company at a standstill. One of the major problems that data infrastructure technology is generally affected by is hackers and security issues, where ransomware or another form of negative software or virus attacks the data and wipes it clean. If this happens, it can be almost impossible to get any of the data back or stopped confidential information from being leaked, and while the Internet of Things is trying to develop some form of safer security options, recent large-scale attacks on establishments like the NHS and the UK Government are showing how difficult it is. Data is becoming the main structure of our society, meaning solving any problems with data infrastructure technology before it happens is important. What Does Data Infrastructure Technology Need To Be? In order to stop any problems from happening with the data itself, it must be a number of things. Firstly, it will need to be resilient and able to be accessed as soon as it is needed – it cannot be affected by an outage or affected by a forgotten domain renewal. In addition to this, data infrastructure technology must be reliable and also resistant to any form of tampering from things like data spam. In addition to this, scalability is another incredibly important factor. Interestingly, there are a series of new technologies that are beginning to be implemented in order to help with these particular problems, but the main technology people are beginning to talk about when it comes to data infrastructure technology is the blockchain. The blockchain is generally known for being paired with the cryptocurrency Bitcoin, which is growing in popularity across a range of industries such as online gaming with the elusive cryptocurrency and various other online transactions. The blockchain is a complicated piece of technology which essentially acts as a way of storing information without the information being placed on a central server. This technology is a hugely fascinating concept to have developed, and is being discussed more and more as Bitcoin is being pushed into the limelight due to its recent hike in value, and it has even been described as a ‘fraud-proof system’. This is one of the reasons why businesses are looking at this technology much more closely when it comes to protecting their data infrastructure technology. However, there is a little bit of confusion when it comes to the difference between A blockchain and THE blockchain technology, but we’re going to be looking at the blockchain as a whole when it comes to finding a solution to problems with data infrastructure technology. Interestingly, the blockchain provides somewhat of an anonymous environment for people to store their data in, and with this data only being accessible to particular people with private and public keys, this distributed data storage system is one of the most secure to have ever been developed. 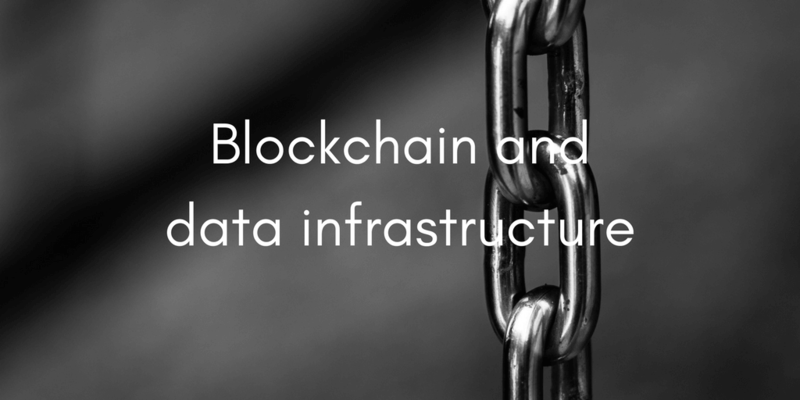 Here, we’re taking a look at the major benefits of the blockchain and just how it can help to solve issues with data infrastructure technology. A hugely important factor to do with the blockchain is the fact that the data is meant to last forever, and this data is available to everybody who has access, meaning it is totally transparent. While there have been a number of rulings such as the latest EU right to be forgotten ruling that may put this kind of technology into somewhat of a grey area, currently, the blockchain is totally immutable. This is particularly important for large businesses whose data has been hacked into and rewritten or erased. With blockchain as part of the data’s infrastructure, you will find that the data within it can never be rewritten or erased, by anybody who has access. How Can The Blockchain Solve Problems With Data Infrastructure Technology? Data infrastructure technology can be scaled into a range of different areas, from global, national, local and more and it can be implemented across every sector that you can think of. While the blockchain itself hasn’t been fully developed as a data storage system to be implemented by businesses right now, there is a lot of potential for the blockchain to provide a much safer and more secure option for a business’ data infrastructure. Hackers with viruses and ransomware are unable to access the data because the data is currently completely secure. While there will be a time when hackers can access the blockchain, the technology is already exceptionally advanced, providing a much more secure option for businesses to store their data.